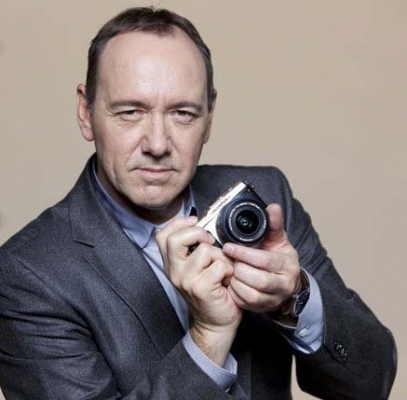 It is not an Olympus or Panasonic news but I believe this news will be interesting for everyone who loves photography. I always liked Rollei cameras! Few months ago the Franke & Heidecke GmbH (the producer of the Rollei cameras and lenses) declared the insolvency. Now a new company, the DHW Photo GmbH wants to resurrect the camera production! According to available information, the DHW will resume production on an area of 2000 square meters, spread over three floors, with 20 coworkers. Original article at photoscala.de: Read in german or read the google english translation. UPDATE: the contact form problem has been solved. You can send me messages if you want! We have some technical problem with Aksimet which blocks our form. It doesn’t work since 24 hours and your messages sent through our form are probably lost. If you want to contact me use write me at 43rumors@gmail.com. I will let you know when the form will work again. Group half year operating income actually amounted to 28.5 billion yen, down 11.2 percent from 2008-09, and quarterly operating income to 17.2 million yen, up 17.9 percent compared to the same quarter last year. These results are indeed better than the analysts’ expectations. As for the “Imaging” business unit (= cameras and lenses), sales were down 42.9 percent for the first quarter (April-June) and down 31.6 percent for the second quarter (July-September), each time compared to the same quarter one year before. Operating income tumbled 96.2 percent for the first quarter and “only” 31.6 percent for the second quarter. Olympus E-P2: All the informations you need continually updated inside this post! This page will be continuely updated! Photoscala.de. Google english translation available here. Dave Etchells (Imaging Insider) talk with Sally Smith Clemens of Olympus about the new E-P2 Digital Pen. Thanks everyone for sending me the links! 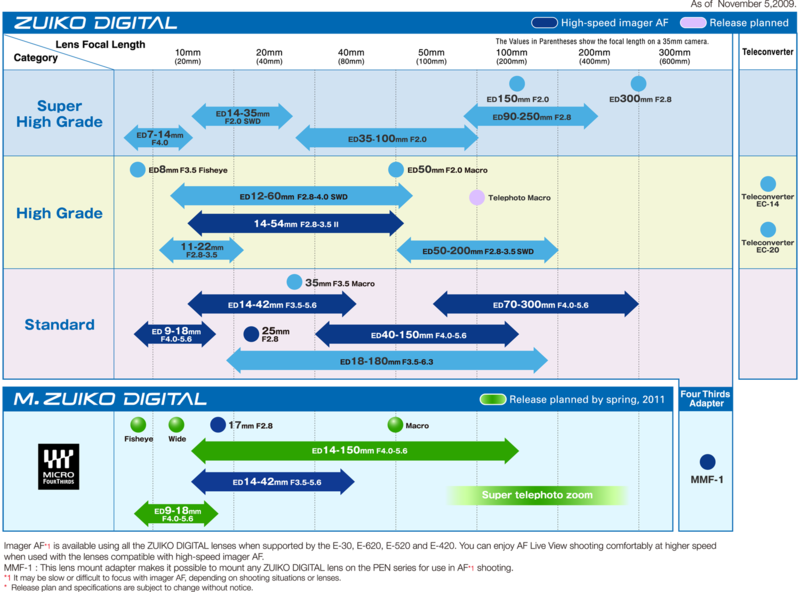 The Lens roadmap…Fisheye, wide and macro lenses also coming! Olympus E-P2 officially announced on dpreview! London, 5 November 2009 – Welcome back to the PEN story and the next chapter: “Back to Black”. This latest retro-chic digital Olympus PEN builds on EISA’s 2009/2010 “Best Camera of the Year”, an icon of style and quality. To enrich photographic potential, the new E-P2 includes a port for an electronic viewfinder or external microphones. Two additional Art Filters combine with the new i-Enhance function for yet more creativity and image enhancement. Two new Micro Four Thirds lenses are due in the first half of 2010: the M.ZUIKO DIGITAL ED 9-18mm F4.0-5.6 (18-36mm*) super wide-angle zoom and M.ZUIKO DIGITAL ED 14-150mm F4.0-5.6 (28-300mm*) high-power telephoto zoom lenses. Cloaked in classic black, the hybrid photo and HD movie Olympus PEN boldly brings fun and simplicity back to SLR quality. It’s the next exciting chapter in a photographic story that is set to run and run. Available from January 2010 for £850 including the electronic viewfinder. Reliably crisp images are secured through the 12.3 Megapixel Live MOS sensor combined with a dust reduction system and high-performance in-camera image stabilisation giving protection against shake to 4 EV. And at the core of this PEN is the guarantor for fast, top-quality image processing, even at up to ISO 6400: the state-of-the-art TruePic V engine. The Live Control GUI simplifies operation while the effect of functions can be monitored in real time – on both the 7.6cm/3.0” HyperCrystal LCD and the 1,440,000 dot electronic viewfinder. Diorama: Enhances a composition’s depth of field to give the image an unreal touch and model-like structure. Cross Process: Returns depictions with striking colour and contrast shifts akin to those achieved through the cross processing technique in silver halide film development. Pale & Light Colour: The foreground is enclosed in flat, gentle light – similar to a flashback scene in a film – creating a sense of déjà vu. High-definition video (HD video) delivers high-quality movies at a resolution of 1280×720 pixels and a rate of 30 frames per second. This “intelligent-Auto” mode uses advanced automatic detection technology to allow the camera to recognise the six most commonly used scenes automatically. They enable the capture of perfect photos without any need for manual settings. Micro Four Thirds was developed to maximise the performance potential of digital imaging technology. It allows users to enjoy the same high image quality as the Four Thirds Standard’s 4/3-type image sensor in a much more compact body. The new Micro Four Thirds Standard enables the development of ultra-compact interchangeable lens type digital camera systems unlike anything seen before. It also incorporates a greater number of lens-mount electrical contacts for the support of new features and expanded system functionality in the future. The E-P2 lets photographers choose from four different aspect ratios that enable individualised framing of scenes. These provide a new means of adding expression to shots and the selected ratio can be seen directly on the camera’s LCD. The available aspect ratios include: 16:9, 3:2, 4:3, and 6:6. 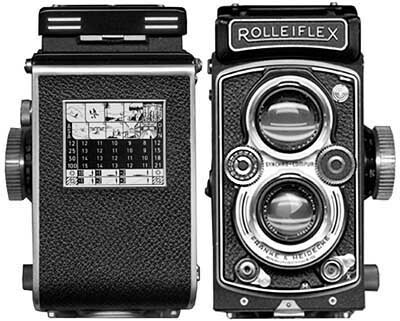 The PEN series was first introduced in 1959 as a half-frame camera. With its revolutionary design and price, this camera made photography available to a much bigger user group. The idea behind its design was pure and elegant – to create a camera that was as easy to carry and use as a pen. The PEN was designed by legendary Olympus designer Yoshihisa Maitani, one of the most famous product designers in the history of photography. In 1963 the PEN F was launched as the world’s first 35mm half-frame system SLR. By the time it was introduced, 16 lenses were available. 17 million PEN cameras were sold, making it one of the most popular and successful cameras ever. Today PEN cameras are a much sought after collector’s item and are traded for incredible prices on the second-hand market. Dust entering digital cameras with interchangeable lenses can cause damage to photos. The Supersonic Wave Filter is a transparent filter which is located between the camera’s shutter and sensor. It shakes off settled dust particles by generating a series of ultrasonic vibrations. Olympus was the first to incorporate dust protection. Olympus’ latest image processing engine. It automatically enhances important aspects of image quality including: colour reproduction (colour range, saturation and brightness), picture sharpness (reduced image noise, improved edge reproduction), as well as providing faster processing speeds. Furthermore, it supports Art Filters, HD movie quality recording, and high sensitivity shooting at up to ISO 6400 to enable unprecedented creative expression.